Ultimate Thor – Finally an Upswing for the Ultimate U! I had been putting off reading this, simply because the Ultimate books have become so lame. When the Ultimate U opened up, it was like a refreshing wind that blew in… recognizable characters and stories but with a fresh look and feel. But then that wind took a sour turn and we started getting event after event (like the MU), everything seemed to revolve around the mutants (like the MU) and even got filing cabinets filled with alternate covers (like the MU) and it got just so bad, I shut down and stopped reading the books… seriously one of the new main books is called “Ultimate Comics New Ultimates”, it reads like the American Dodgeball Association of America… lame! 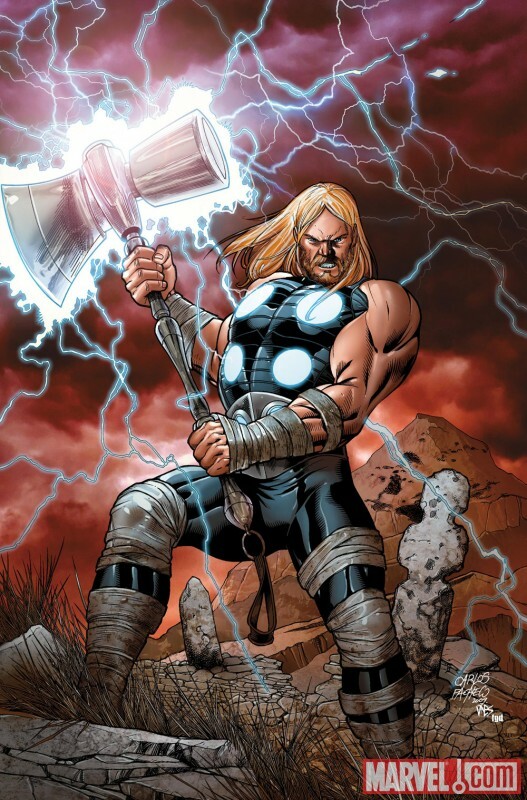 But thankfully in this “10th year anniversary” month for the Ultimate Universe, we get a book like Ultimate Thor that represents the best of what the Ultimate U is! In small subtle steps and in huge dramatic leaps, author Jonathan Hickman is carving out an office for himself in the hearts of fanboys and girls everywhere. And his office’s title is Icon. He writes good, solid, exciting stories consistently. He takes a recognizable venue then redecorates and remodels in such a way that even the oldest of fans loves what he has done with the place (i.e., Marvel standbys like the Fantastic Four – coming out this week! don’t miss it!). He now gets to helm Thor, who was one of the most interesting characters in the original Ultimate books. He bypasses all of the Ultimatum / Ultimate Enemy / Ultimate Doom “I need to buy every title so I know what the hell is going on” storyline crap that is bogging down this comic line and Hickman constructs a story that anyone could jump into and read and thoroughly enjoy. He weaves WWII and Asgard into a plot that blends right in with the Ultimate Comics line or stands alone as a self-contained title. Is Thor simply a scientific construct? A mentally imbalanced mutant? An ancient and powerful being? An amalgam of all of the above? This is so worth reading! And while I am gushing, let me share the love… Carlos Pacheco’s art shows why he has earned the right to play with the big boys. It’s both beautiful and brilliant! I know it came out a few weeks ago, but take this is as a reminder to get issue #2 out Nov 10th! Bottom Line: It’s a fantastic new series and you can get in at the ground level – best Ultimate book on the shelf!